Near the tip of Michigan's "Thumb" lies Grindstone City, once famous as the world's leading exporter of grindstones. Today it looks more like a summer cottage community. The mills are long gone, but the legacy remains..."etched in stone," if you like. 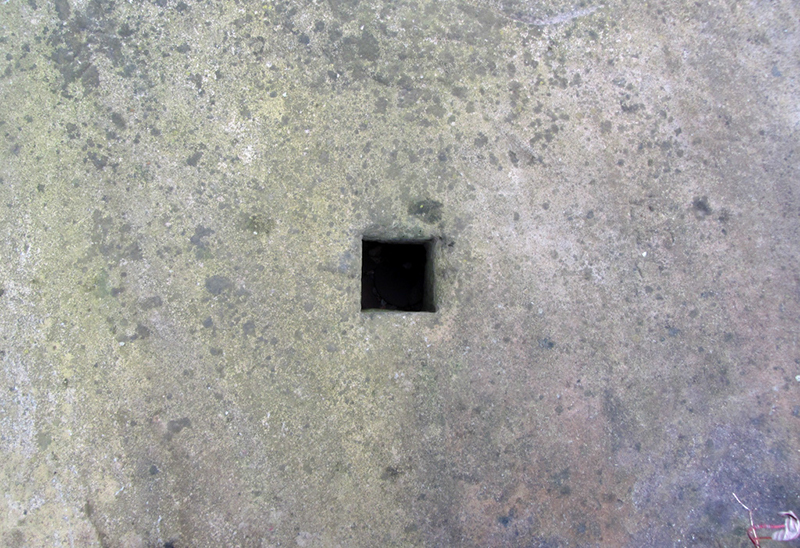 This is one of those compelling places that is literally made out of itself; everywhere you look in town there is a grindstone, or a piece of one, as lawn ornaments, signs, parts of buildings, or just laying around. 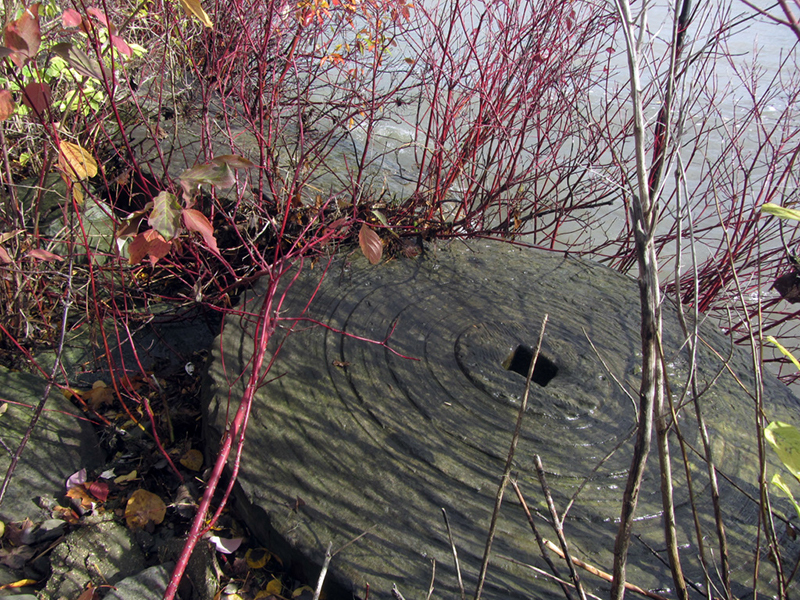 The beaches themselves are made up of old weathered and broken grindstones. It joins the ranks of other Michigan locales named after the mineral they became known for: Alabaster, Copper City, Calcite, Cement City, Iron County, Port Dolomite, Topaz, Hematite, Silver City, Clay Township, etc. I never really paid Grindstone City much mind until one day I came across an old postcard image from "the beach at Grindstone City" which showed a bunch of 1970s people in gratuitous, full postcard color strolling along a beach that happened to be strewn with monolithic stacks of gigantic, ancient-looking grindstones spilling all over the place, apparently left behind when the mills closed up decades ago. Obviously something that dramatic I had to go see. 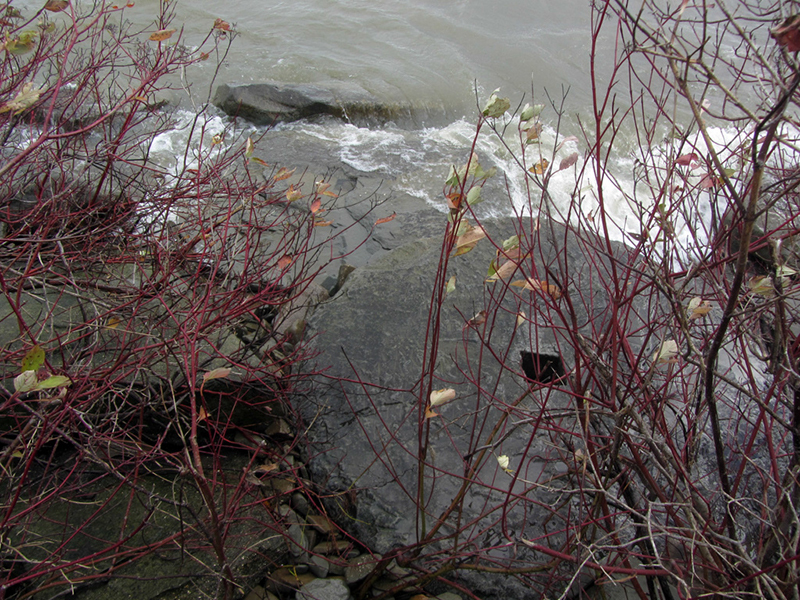 Unfortunately most of the big piles have walked away, but many still remain, embedded in the shoreline. According to the Michigan County Atlas by David M. Brown, Territorial Governor Lewis Cass said during his 1820 expedition of Michigania that the Thumb area was not worth surveying. It was eventually surveyed anyway, and of course found to be rich in high grade timber. NOTE: Mr. Brown wishes to clarify that Cass's claim that the land was "not worth surveying" actually referred to the area more immediately north of Detroit, now Oakland and Macomb County, and that the area north of Detroit was described in 1815 as a "swampy morass" by the first surveyor, Edward Tiffin. Logging peaked here in the 1870s, and the barren, cutover wastelands of slashed boughs and dead stumps left behind were the perfect setting for a disaster. After a hot, dry summer, the cataclysmic Thumb Fire of 1881 swept over the entire region. Despite destroying and killing everything in its path, I suppose that it was a boon for the farming that was to follow upon the Thumb's rich soil. 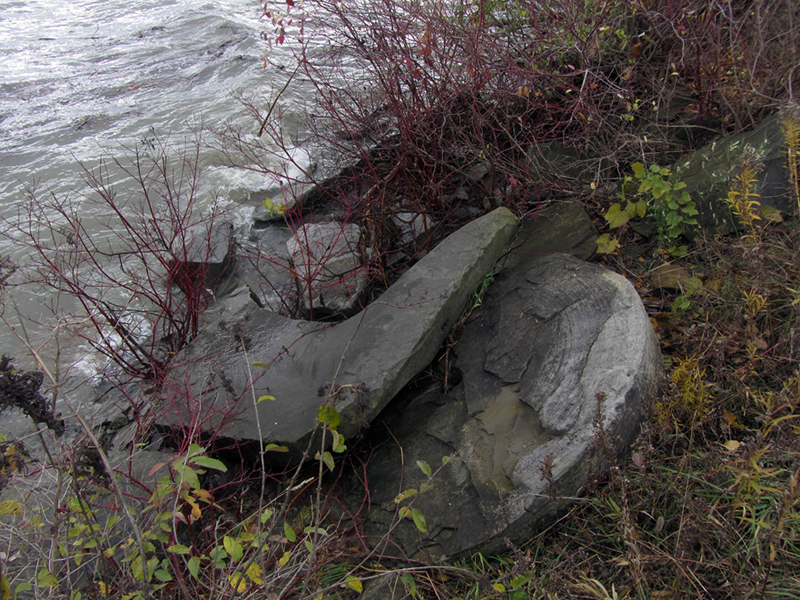 Brown says that the discovery of workable sandstone here occurred in 1834, by accident. 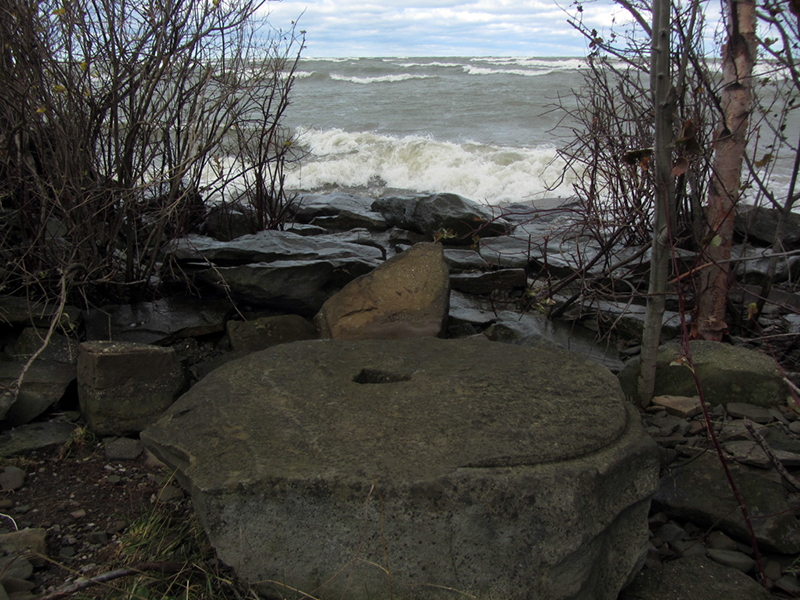 A vicious Lake Huron storm forced Captain Aaron Peer to shelter his schooner within reach of what is now Pointe Aux Barques, and that was when he spotted the quality stone. 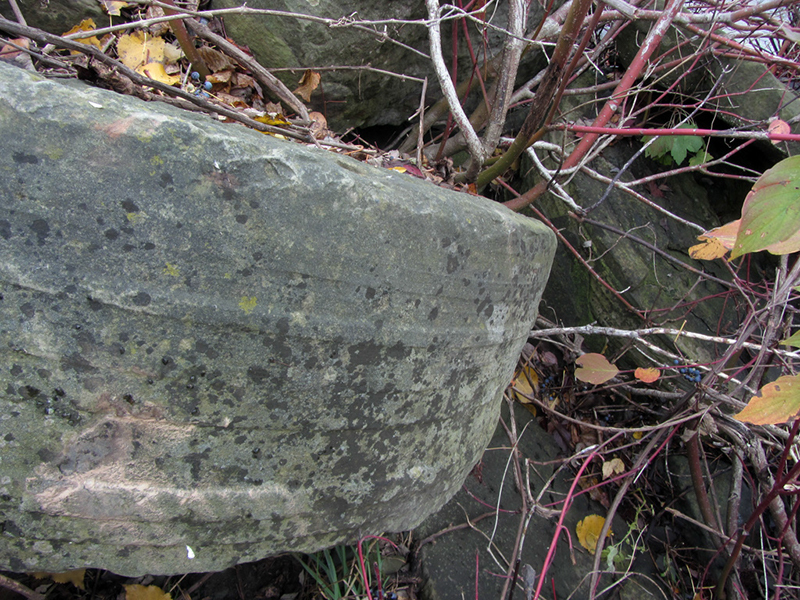 It is said that the Sanilac Petroglyphs were only discovered after the fire burned the forest cover away, so perhaps the Great Thumb Fire also aided the uncovering of more sandstone reserves as well? Brown says that Captain Peer had some of the stone quarried, and it was brought back to Detroit in his ship, where it was allegedly used to pave the intersection at Woodward and Jefferson. 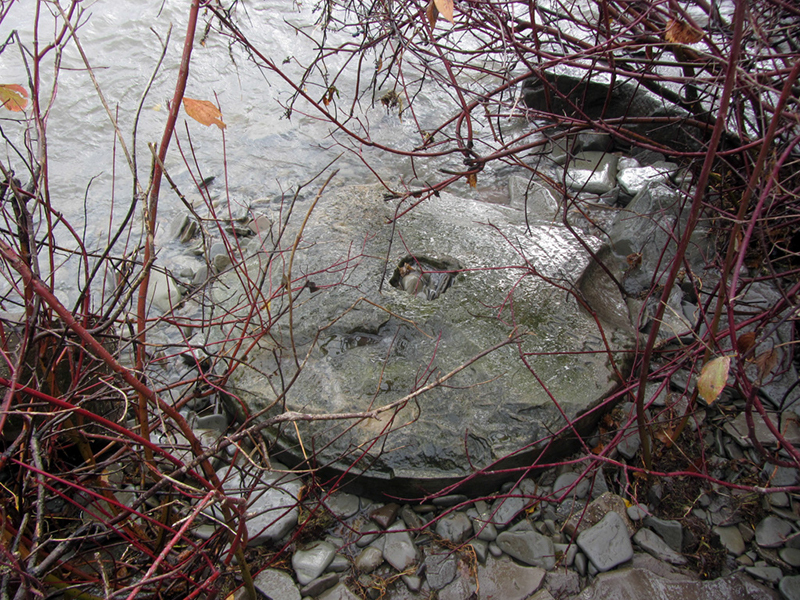 An article from Michigan State University's Geology Department verifies this, and further notes that the paving project had been originally planned with Ohio flagstone, but in comparison to the Michigan product the Ohio stone was found inferior (as well it should be). 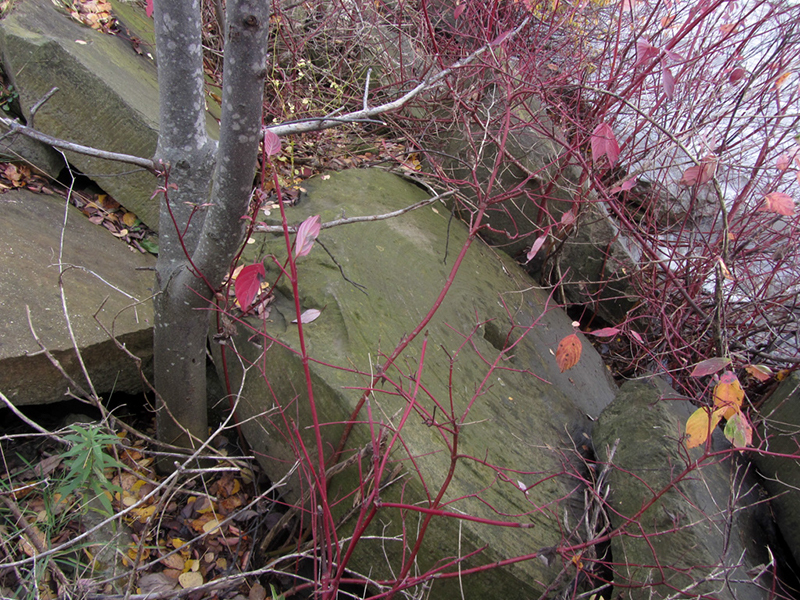 Some early buildings in the city of Port Huron were also built on foundations of Grindstone City sandstone. The first grinding wheel was made out of it in 1838, supposedly after the sailors aboard Captain Peer's ship decided the stone they were hauling as building material was also pretty good for sharpening stuff. By 1850 Peer had a small water-powered mill here turning out 100 tons of grindstones annually, but the town did not get its famous name until 1870. 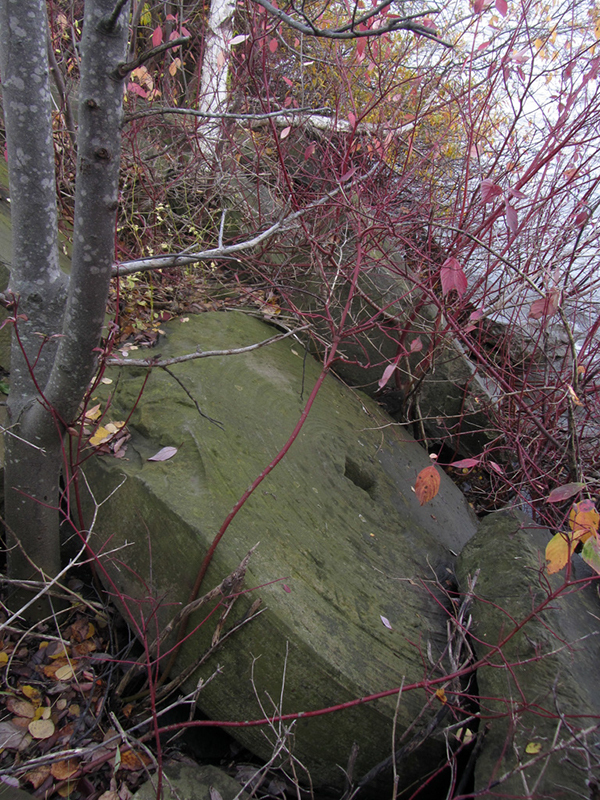 The book Michigan Yesterday & Today by Ferris Lewis says that this stone comes from the Marshall Sandstone geologic layer, so-named because it was first quarried there at the town of Marshall, near Battle Creek. 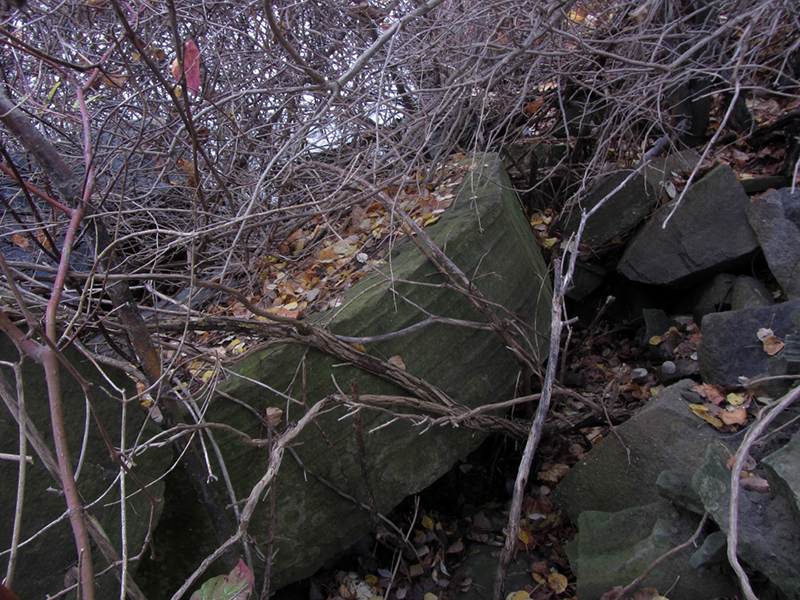 It was later also quarried in Jackson County, but neither of these locales had the same fine consistency as Grindstone City's outcrop. The textbook Geology of Michigan by Dorr & Eschman seems to indicate that the Marshall layer formed during the Mississippian Period of the Paleozoic Era, over 300 million years ago. 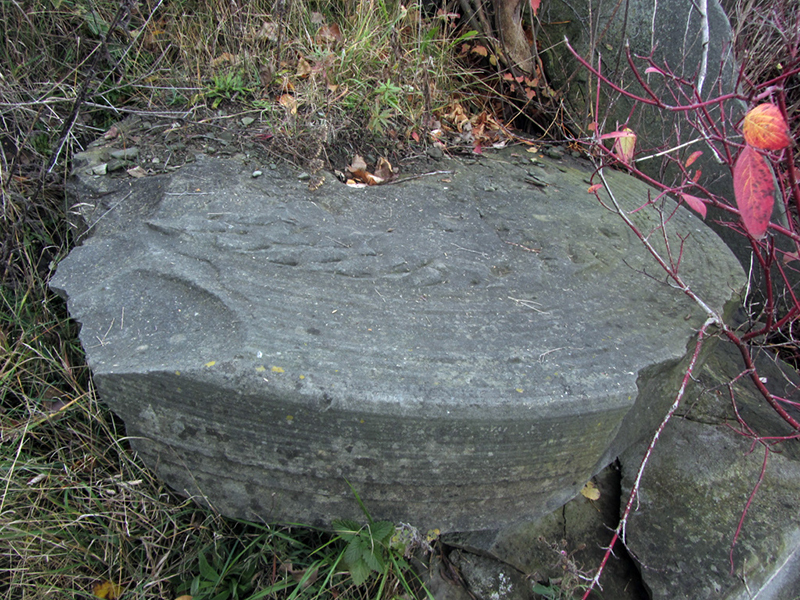 This soft, unique Michigan stone was quarried in several places around Grindstone City, such as at the Eagle Bay Quarry, which today has filled up with water from being long abandoned. It is not found anywhere else in the world. They are in all shapes and sizes. I am told that the larger, better stones were removed long ago for use as peoples' lawn ornaments. 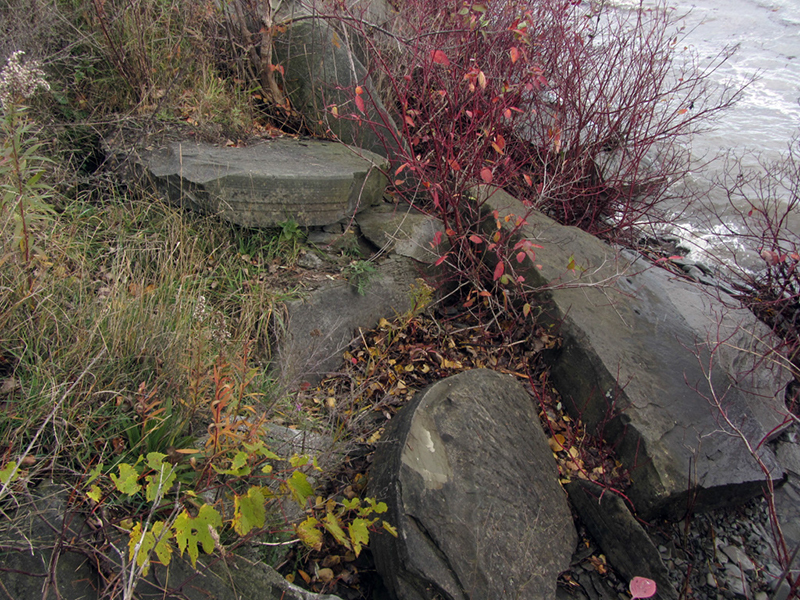 I imagine that the Wallace & Co. Mill probably disposed of damaged or imperfect stones by using them as riprap to reinforce the shoreline. 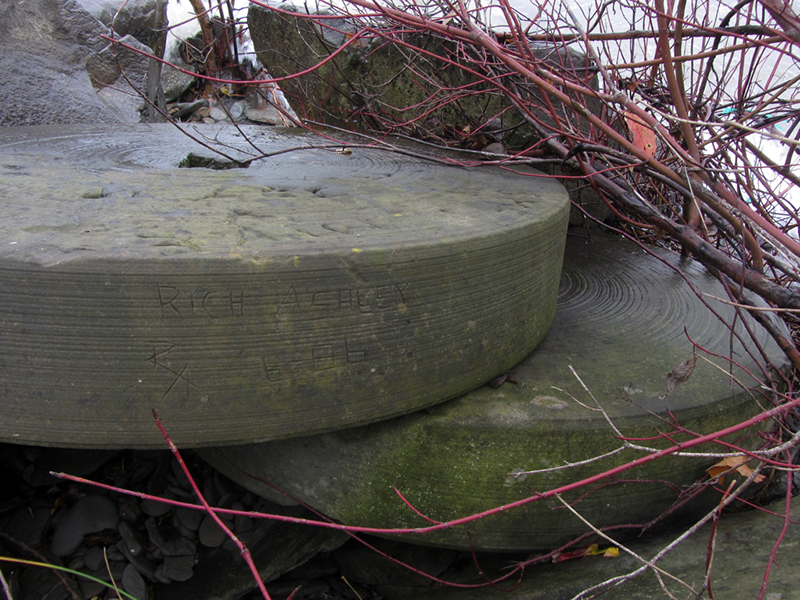 Grindstone City was known as the home of the world's highest quality grindstones for 100 years, and produced them in sizes from three pounds to 12,000lbs...up to seven feet across and a foot thick. The two grindstone companies that operated here employed a total of 800 workers, making them the biggest employer in Huron County. Large docks once stretched over a half mile out into Lake Huron, where ships would take the stones to destinations as far away as Egypt, South Africa, Russia, Europe, and elsewhere. These docks were obliterated during the Great Lakes Hurricane of 1913, and from then on all grindstones were shipped by rail. Grindstone City boasted two hotels, six stores, and a gristmill. Photographer Marty Hogan has a c.1950s postcard on his Flickr of the old Wallace & Company Grindstone Mill. 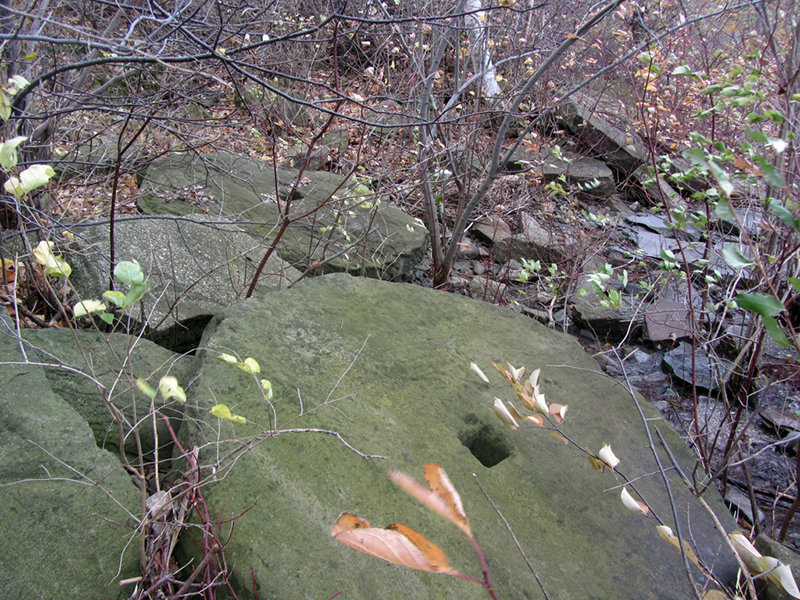 The grindstone quarrying operation generally began by clearing everything from grade level, including trees, soil, and any loose shale, until solid sandstone was found. The stone was then sectioned out into blocks by a steam-powered drill, split by wedges and hammers, and hoisted out to be transported to the mill by wagon. 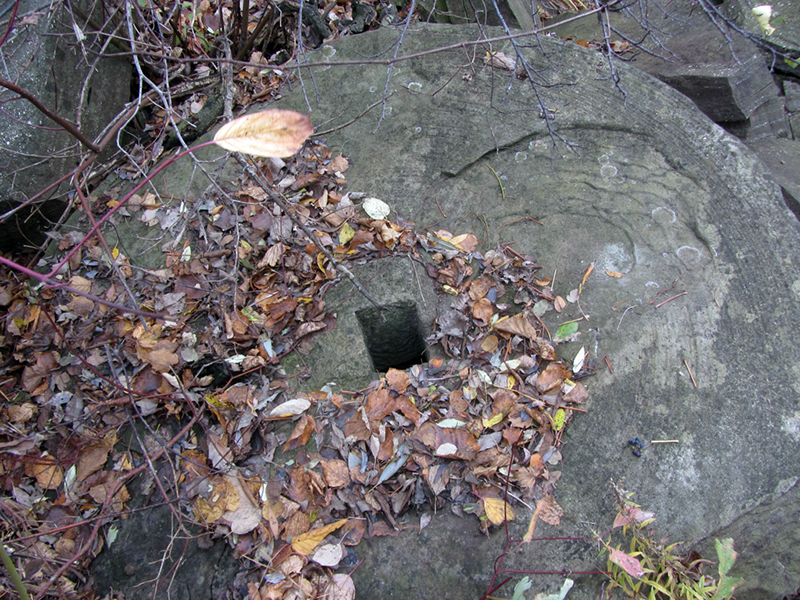 The grindstone companies eventually maintained their own narrow-guage railroad between quarry and mill. 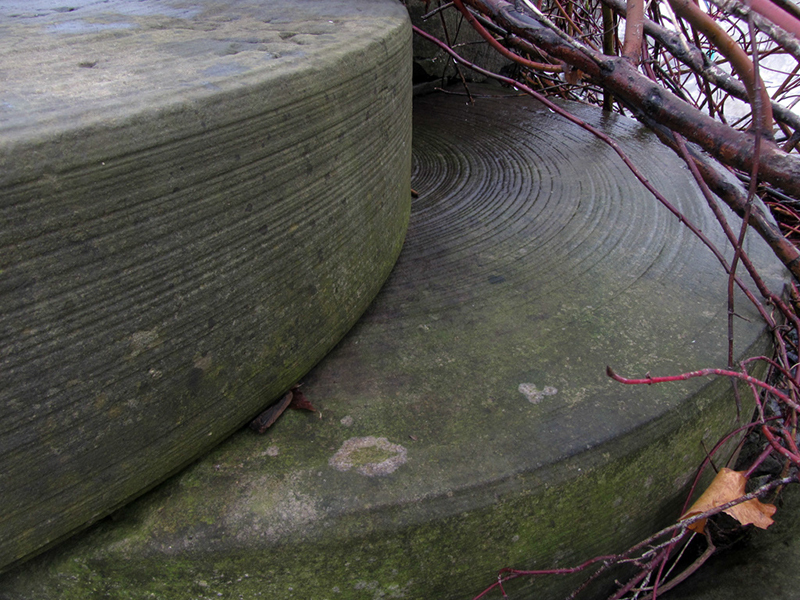 There were two grades of grindstone, "heavy" and "light." 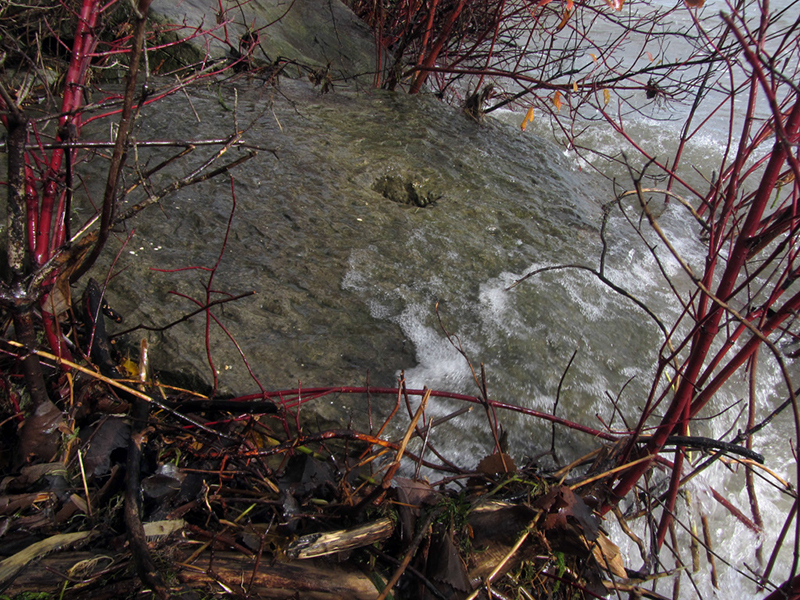 The light stone was found near the top of the deposit, and was softer. The "heavy" was found deeper in the strata and had a denser grain as a result of the greater compacting geologic pressures exerted on it, which made it even better for fine honing. 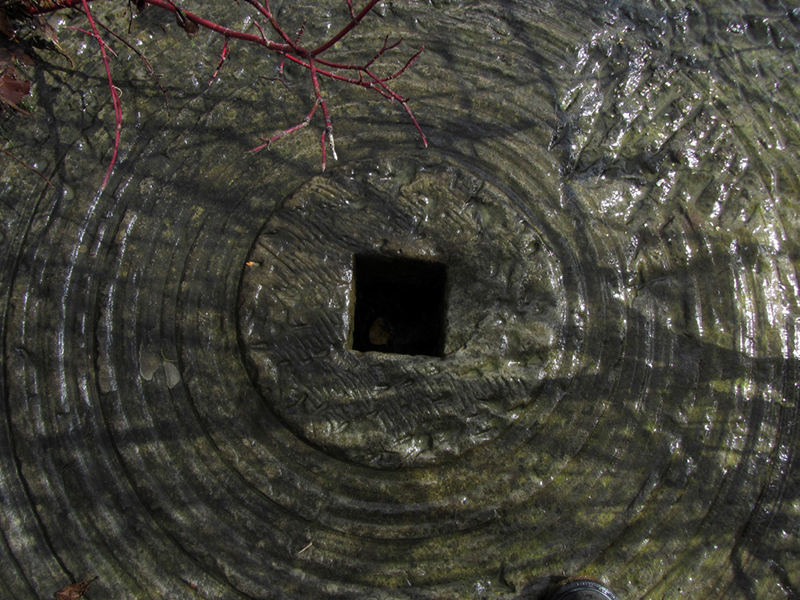 The method of turning a block of stone into a round grinding wheel was accomplished at the mill via a primitive manual turning process that essentially performed the same operation as a lathe. 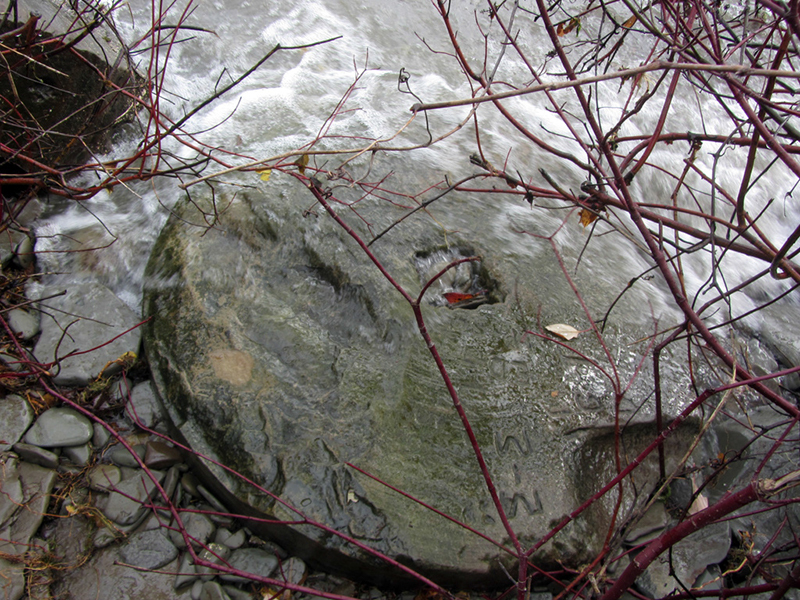 First the porous stone would be soaked, because it was less prone to chipping when saturated with water. Next it was fastened to a drive shaft that was turned by a steam engine, and men with metal chisels would hand-tool the stone as it was spinning until it was uniform in shape. After they were finished the stones were dried so as to be lighter-weight for shipping. 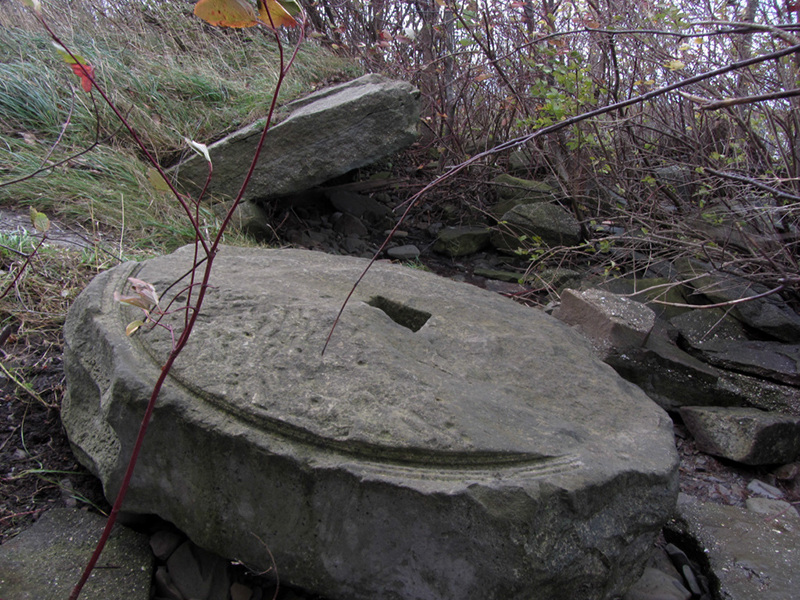 An adjacent mill turned out the whetstones and scythe stones, which were much smaller. 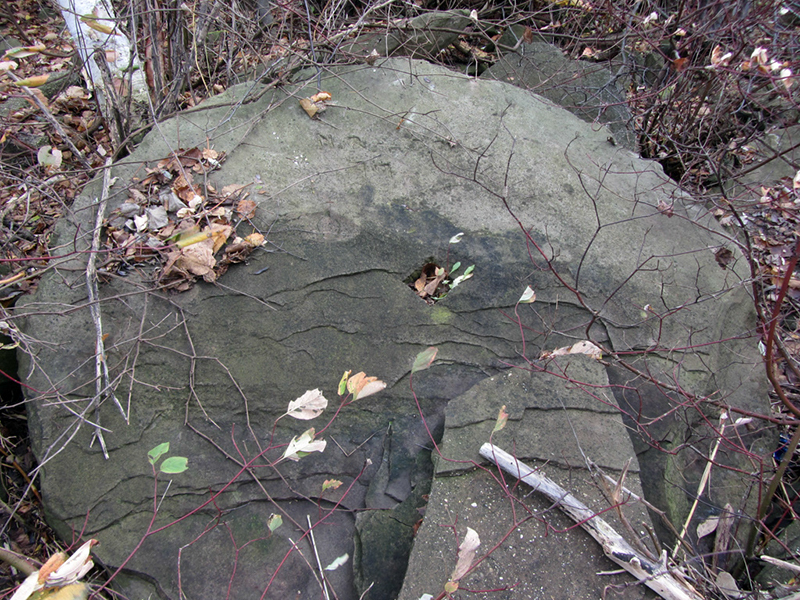 Some of these stones were in great condition still; almost as if they had been set here recently, and not decades ago. Something about seeing a beach made out of these things with waves washing over them was striking and made me think of some lost ancient civilization like you'd see in Greece or somewhere, with shattered columns and temples crumbling into the sea. Very dramatic. Captain Peer operated the quarries until about 1865, and eventually sold his interest. 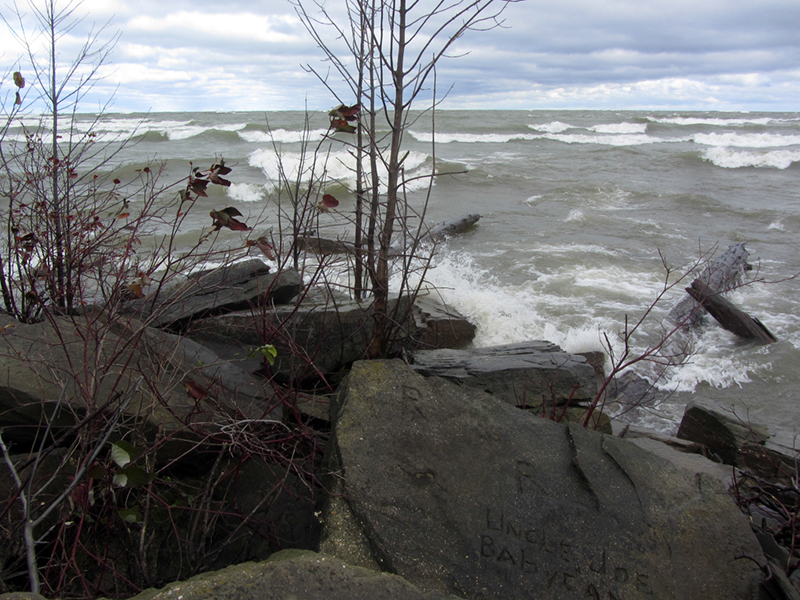 The quarries were then operated by Robert Wallace of Grindstone City, and Frank and E. L. Wallace of Detroit, under the name "Lake Huron Stone Co." according to "History of Grindstone City Area," by Mabel Cook. 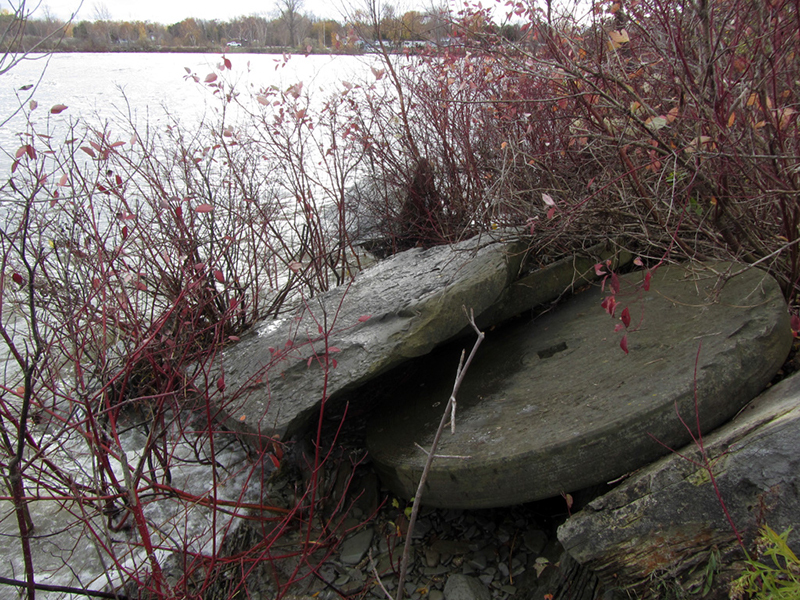 I imagine a visitor to this place a thousand years from now might see these things sitting here and mistake them for primitive chariot wheels, or wheels for Flintstone cars, or for that giant stone money on that one Pacific island. 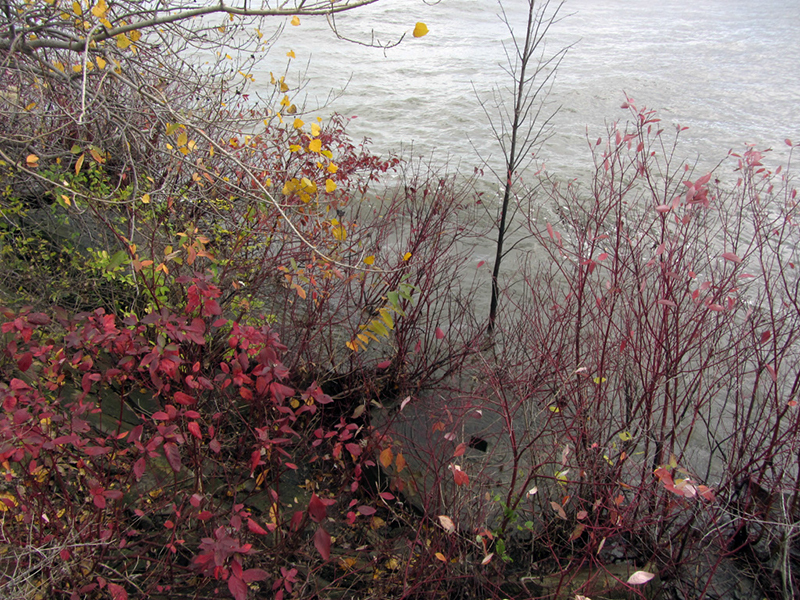 In fact I was getting frozen stiff in the stinging autumn winds. Sadly, with the coming of artificial carborundum whetstones around 1915, the natural grindstone business began to wane. This was simply because it was more labor-intensive to extract and shape grindstone than it was to make the cheaper carborundum, even though the real stuff was superior in quality. By 1929 the native Michigan product was obsolete. 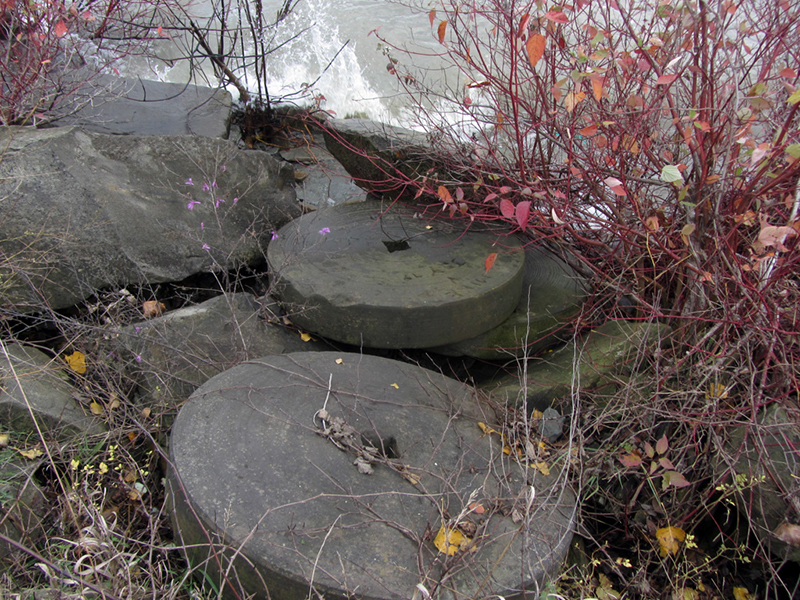 Brown says that in 1936 the last quarry here closed up, and the once bustling center of the grindstone industry at Michigan's "Thumbnail" fell from world prominence into ghost town status, the unsold inventory left laying abandoned on the beaches as an eternal reminder. The MSU Geology Department's article said that the quarries were still worked on occasion when super-high quality hones were needed, as the carborundum just doesn't quite produce as fine an edge as the genuine article. The Grindstone City post office closed in 1972. The Lewis Cass claim that the land "not worth surveying" referred to the area more immediately north of Detroit, now Oakland and Macomb County. The area north of Detroit was described in 1815 as a "swampy morass" by the first surveyor, Edward Tiffin. Cass personally explored the area north of the swamp in 1818 and found beautiful lake country, oak openings, and areas that had been farmed by the Indians. At the time the Thumb region was vast, dense forest, until it was logged off and burned to the ground in 1871 and again in 1881. LOVE this page! I was raised near Grindstone City and was just doing a little research as it plays a small role in a book I am just finishing. Thanks for the pics and the travel back it time.